In late 2010 Faryn was born at 24 weeks and 5 days weighing 1.1 pounds, just 15 weeks and 2 days shy of being full term. Following her birth, Faryn was immediately intubated allowing machines to breathe for her since her lungs were to weak and premature to do it for her. All of her bodily functions were maintained by machines; heated bed to her her maintain her body temperature, machines to her breathe, machines to help her eat, etc…. Over the course of her life Faryn has battles pneumonia, medically induced coma, infections, illness and numerous set backs. Her first surgery at three months old to prevent her from going blind was just the first of many. 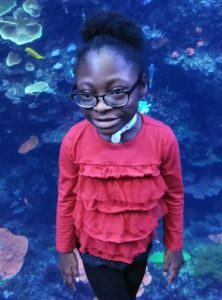 Over the last five years Faryn has has numerous minor and major surgeries including but not limited to airway broncs, ear-tubes placements, fundoplication, tracheostomy surgery and major surgery on her airway in hope of decannulation. Unfortunately, the airway reconstructive surgery failed and we decided against a more invasive and risky surgery. Due the fact that faryns lungs work three times harder than a child her age and the fact that she is very active has stunted her weight gain. Faryn has not gained anyway weight for the last four years. Though she has maintained her weight she has not gained anyway weight causing her to be the size of a five year old. Faryn’s motor and social skills have greatly improved but we are still working on her feeding and eating skills. at 8 years old faryn is dramatically underweight, weighing as much as a 1 year old. Faryn still doesn’t chew her food but we are finally in feeding therapy but seems her progress has stagnated due to having pneumonia and missing two weeks during the first month of school and missing therapy for two months.The fact that she doesn’t chew makes her diet extremely specific and expensive. No variety in her diet and without help or a change soon, he future will be greatly affected. While Faryn is a smart, happy and independent child who has overcome major life hurdles, we still have a long way to go. Playing the Piano. she loves music and to built things. She was to be a magician when she grown up then a detective cop when she turns 46. She loves to dance and to watch barney. Reading books and exploring outside.